If you just moved to Umbria in Italy you might need to furnish your house with a style that suits your needs and your new home in Italy. While visiting the home of some friends that live in Umbria near the town of Po' Bandino, I saw that they had bought many modern and classic piece of furniture that mashed up pretty well in their house. My friends just built, actually enlarged, a pre-existing farmhouse in Umbria, and here they spend large portions of the year when the season is nicer and during the Christmas holidays. However, last time I saw this house it lacked almost all comforts and it just had the very basics to stay a few days. Now they decided to go a step further and completely refurnished this house in Umbria to make it a very comfortable nest. It is nice to see that they found everything they needed. The kitchen is quite modern and kind of surprises in a farm house in Umbria to see very straight lines and cubic shapes. It is a very trendy kitchen indeed. However, the color and the details make it in tune with the brick walls and wood beam ceilings. From the kitchen you step in the living room and here you see old-fashioned sofas in front of the stone fireplace. 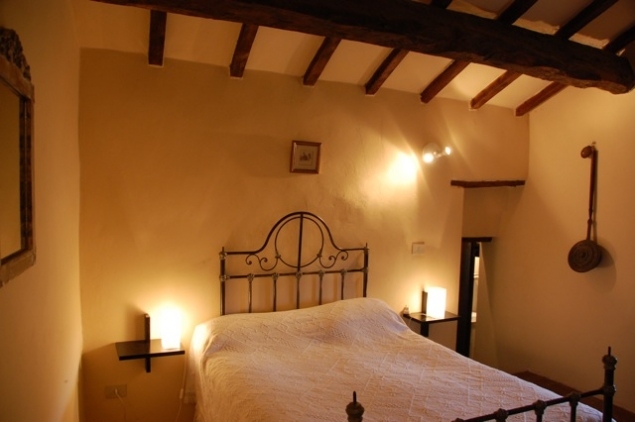 Bedrooms are also in tune with the most traditional Umbrian style, with wrought iron beds and antique chests and wardrobes. They told me that they had found everything they needed in a large showroom near their house. The name of the show room is Casa Camil in between Po' Bandino and Città della Pieve. The strength of this shop is the dynamic and young owners that can combine the new trends with the ancient Umbrian style. Also they found many important design names there, as Italy is among the first in the world in this field, but they also could find less famous and expensive antique furniture and also contemporary furnishings. If I ever can make it and build my house in Umbria, I will surely go to Casa Camil. My friend are so enthusiastic about their buy that I thought I would write about this and give some advice to those the need to furnish their new home in Umbria. You can find the shop in Via Marche in Po' Bandino, and you can contact them by e-mail at info@casacamil.it or at their website at www.casacamil.it. The showroom is closed on Sundays and it is open on normal hours with an afternoon break from 1 PM to 3 PM every other day.